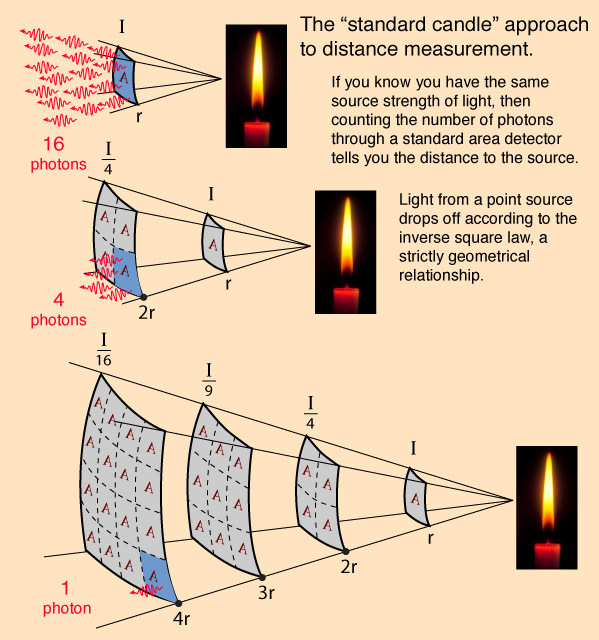 Standard candles (as they are called) are important tools for scientists when trying to measure the distance to galaxies that are far, far away, but before we get into those.. let’s talk about how we measure distances that are nearby (cosmologically speaking of course). Astronomers use a certain kind of star, called Cepheid variable stars, to measure distances throughout the Milky Way. To put it simply, variable stars are stars that change in brightness. Sometimes there are changes in the star’s luminosity, mass, or otherwise obstructions in the photon’s path as it makes its way towards Earth. These changes in luminosity can take place over an extended span of time or, in some cases, a fraction of a second. More than 100,000 stars are currently known and cataloged as variable stars (including the one seen in the GIF to the right here, Hubble Variable 1 [HV1]) , some can range from one-thousandth of a magnitude in brightness to twenty magnitudes (which are quite surprising numbers)! Furthermore, our own sun is counted among them. Its energy output varies ever-so-slightly over an 11-year solar cycle, sometimes by approximately 0.1 percent or to one-thousandth of its average magnitude. Since variable stars are known to pulse periodically (which is related to luminosity) due to instability or a number of other things. Most typically, Cepheid variable stars (which are usually far more massive than the sun is, as well as more luminous) are used to determine distances. These stars vary in luminosity (growing bright and then dim) based primarily on how massive they are, where they are located and how distant they are. Knowing how massive the star is, we can basically determine what the star’s absolute magnitude should be. and comparing those numbers to the apparent magnitude (how bright it looks to us) can give astronomers an accurate idea of how far away an object is. Now, think of the inverse square law, which basically says that the energy we receive is inversely proportional to the square of the distance. In this particular context, it says the intensity of the light from a star will grow predictably dimmer over the course of its journey to us. Now, to measure extremely long distances (typically from sources that are outside our galaxy all together), we use type Ia supernova blasts as standard candles. These supernova blasts are unlike ANY other supernova types we have knowledge of. There are a few different ways these things happen, but they are typically formed when two white-dwarf stars in a binary system collide, or one of them siphons enough material from its partner to temporarily reignite before ultimately exploding and becoming incinerated. These are interesting little buggers though. Astronomers have collected a lot of evidence that suggests the peak light output from one of these supernova blasts should always have an absolute magnitude of -19.6, which is a LOT more luminous than typical supernova blasts — over 5 BILLION times brighter than the sun, for that matter! Again, using the inverse square law, we can infer the source’s distance simply by measuring the peak light output before comparing the number to its absolute magnitude. They are typically about 14 magnitudes brighter than the Cepheid Variable stars and can measure distances up to around 1,000 MPC (parsecs), which is just a small fraction of the overall radius of the observable universe, but very handy with our current technology!